ALEXANDRIA, Va. (AP) — Paul Manafort orchestrated a multimillion-dollar conspiracy to evade U.S. tax and banking laws, leaving behind a trail of lies as he lived a lavish lifestyle, prosecutors said Tuesday as they laid out their case against the former Trump campaign chairman. Prosecutor Uzo Asonye told the jury during his opening statement that Manafort considered himself above the law as he funneled tens of millions of dollars through offshore accounts. That “secret income” was used to pay for personal expenses such as a $21,000 watch, a $15,000 jacket made of ostrich and more than $6 million worth of real estate paid for in cash, Asonye said. 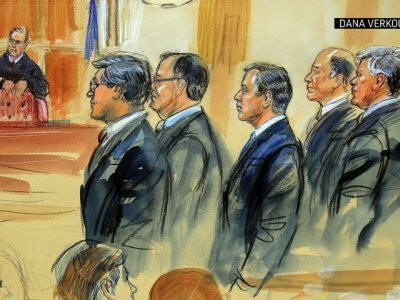 Manafort, who has been jailed for nearly two months, wore a black suit and appeared fully engaged in his defense, whispering with his attorneys during jury selection and scribbling notes as the prosecution began its opening statement. Earlier, U.S. District Judge T.S. Ellis III interrupted the prosecutor during his opening statement to caution him against suggesting there was something criminal about being a multimillionaire. “It isn’t a crime to have a lot of money and be profligate in your spending,” the judge said. “There was No Collusion (except by Crooked Hillary and the Democrats)!” Trump tweeted early Tuesday. Associated Press writer Matthew Barakat in Alexandria and Stephen Braun in Washington contributed to this report.